Inoculate flowering and fruiting plants with the highest CFU’s on the market! 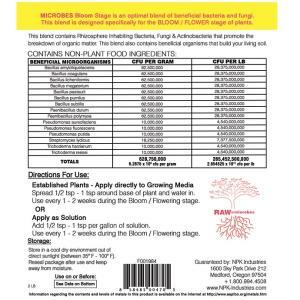 RAW Microbes - Bloom Stage is a special blend of beneficial bacteria and fungi made for flowering or blooming stage in plant development. These microbes promote nutrient availability and plant protection during the bloom stage. The individual cultures and final blend are double tested to assure the finest product for building living soil. Compatible with all nutrient and feeding programs.